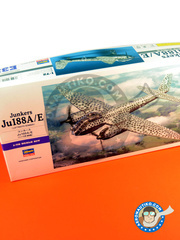 Aeronautiko is back into the battle with a squadron of kits, masks and decals for the most adventurous modelers. 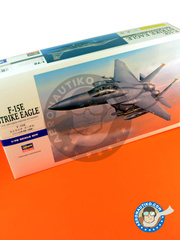 We've brought kits for the F-15 Eagle, Ju188, A-10 Thunderbolt and the Eurofighter Typhoon by Hasegawa, all of them in 1/72 scale and at the lowest guerrilla prices. They're gonna fly!! 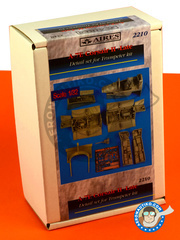 Aires have arrived with several references of their new hiper realistic and detailed resins arsenal for the Apache, the Corsair II, the F-18 and the F-104, for sure the most impressive of them: the detail level on the wheel bay piping of the F-104 is absolutely mind blowing. 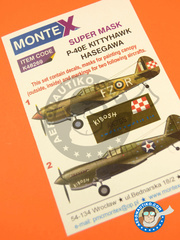 And coming from Montex Mask, a whole squad of decals and masks with very interesting decorations from the II World War for the Spitfire, Fw 190, the Curtiss P40 and the Hawker Typhoon. 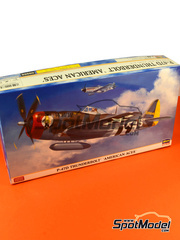 The kit includes a plinth in case you want to assemble it with landing gear retracted, pilot figurine, all weapons you can imagine, and 15 sprues packed with parts in gorgeous grey plastic. 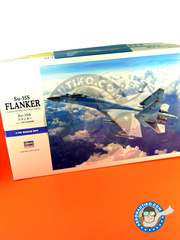 A very interesting kit at an even more interesting price!! Featuring a fully detailed engine and decals for two different and really attractive decorations. 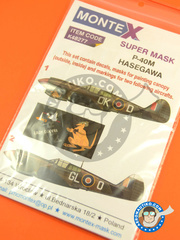 Here are the excelent masks from Montex for recreating two decorations of the RAF Hawker Typhoon in 1944. 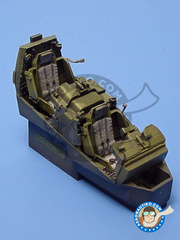 As usual in the brand, the set also includes the cockpit masks. Into the bag you fill find 2 canopy mask for outside and inside, 1 insignia masks, and 1 decal sheet. 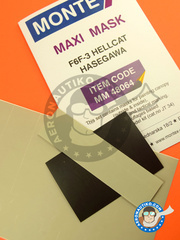 The set includes 2 canopy masks for outside and inside, 1 insignia masks, and 1 decal sheet. Get ready to spend a great time with a really interesting kit. Inside the box, you'll find decals for three different decorations, each one more spectacular than the other. The parts break up is overwhelming, with nothing less that 17 sprues where you could find a fully detailed engine, cockpit, landing gears and lots of more parts. 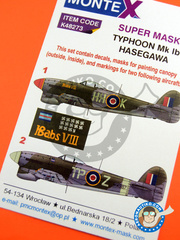 A new Hasegawa kit showing why they're the king of 1/72 scale manufacturers. 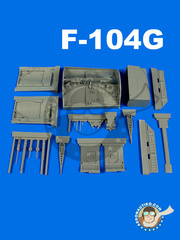 The kit features two different decorations of the USAF, all weapons you can imagine, and a mind-blowing parts break up with nothing less than 13 sprues packed with parts. Do you accept the challenge? 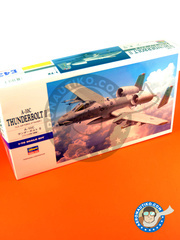 Now you can build your A-10 in 1/72 scale with one of the most beautiful decorations of the US Air Force, the shark showing the teeth over the grey tone camouflage. A really enjoyable kit, isn't it? 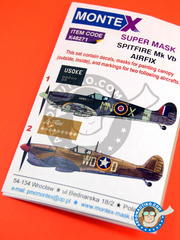 Here are the excelent masks from Montex for recreating two decorations of the RAF Hawker Typhoon in March and July 1945. 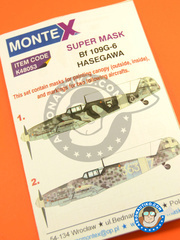 As usual in the brand, the set also includes the cockpit masks. 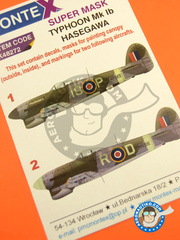 The set includes masks for the cockpit and body of two different versions that flew during the summer of 1943. 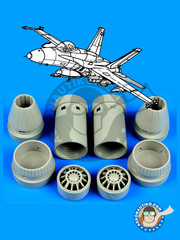 Set of resins designed to enhance the Apache cockpit. The set includes the whole interior in resin, and a photoetch sheet for simulating seat belts, pedals and some other small details. Set of masks and decals for recreating two interesting versions flying in Italy in 1943 and 1944, one of them known as Lady Godiva. Includes masks for both inside and outside the cockpit, as well as for markings and several other decorations. 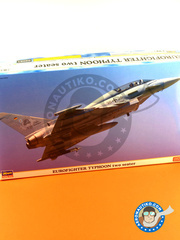 Awesome version of the two seater Eurofighter in 1/72 scale. The part listing is mind blowing, mostly in the weapons area, and you'll be able to choose amongst two different decorations: one from the English Army, and the other from Luftwaffe 50th Anniversary. The product includes 2 canopy mask for outside and inside, and 1 insignia masks. 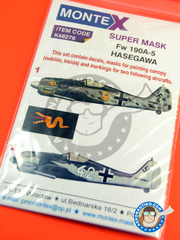 The product includes 2 canopy masks for outside and inside, and 2 insignia masks.